A free country is centered around the protection and wellbeeing of their individuals who are the owners of the State. A socialist collectivistic State have it’s focus on protecting the State and it’s clergy from the individuals. In collectivist socialist nations the States interest goes before the interests of it’s people, what we see terrible examples of throughout Europe today when the Constitutions is rewritten throughout Europe and USA to reflect the new outlook of the national States organisation and how the powers of the States is to be used in favour of those who controls the State. I notice many in the Truther movement is becoming nazists, promoting national socialism (Nazism) and look at Hitler as their redeemer, and they normally go bananas when / if you say anything detrimental to this occultist from the Thule Society and Vril, occult leadership educated at the Tavistock Institute, and I want to state for the records some objections of the worshipping and idolizing of any perceived political ‘redeemer’ and ‘Strongman hero’ that might save them, be it Hitler or Putin (both Jewish controlled opposition). This article is not exhaustive exposing Nationalsozialistische Deutsche Arbeiterpartei (National Socialist German Workers’ Party; NSDAP), but for inspiration to further research. Jazzmusician Trevor LaBonte’s exposes of the ‘Jews’, have gotten him into a war mode with the Jewish community in USA, in the Austin area of Texas. We must not be so hellbent on exposing the Jews of the left side, that we forgot to also expose the Jews on the right side of the political spectrum. In the end this two sides will form a synthesis (hegelian dialectics), that synthesis is ‘Social Democratic’ socialism. Not so very democratic, as the leadership is always chosen by the few, where the population will be only be allowed to vote for those ‘Chosen’ by others as their Masters (not public servants). In a socialist community and State there is always only Masters in leadership. Jazz guitarist Trevor LaBonte is doing an excellent job exposing the Synagogue of Satans (Rev. 2.9 and Rev. 3.9) activities in history. He is became some of an icon in conspiracy circles with lots of followers not questioning anything. This is NOT healthy. There is no use of going rampant of the low level Jews, without exposing the top level ‘Jews’, the occultist Synagogue of Satan (Revelation 2.9 and Rev. 3.9), what Hitler was connected to via the Thule Society and Tavistock Institute. That means we will let the low level ‘Jews’ (they are not more ‘Jews’ then the Inuits, they are Khazars, Edomites and Kenites, for the most part), and let the occultists go free, out of sight. That is the magicians trick, to ‘arrest’ the masspopulation forcus where they want it to be. That way the innocents will suffer for what the high level satanic brotherhood is responsible for. There is one point our roads are taking the different outlook. I just ask myself, why do so many conspiracy researchers promoting National Socialism? USA will have it’s National Socialism; NaZionism. Don’t worry. Everybody will be able to get a very good factual experience of it in America as well, as we had in Europe. It is already on their doorstep, under implementation, as we see. I wil use Trevor LaBonte only as an example. He is doing great work in many areas, so I am not against him in any way. I just see that he and many others have have a blindspot on national socialism they are promoting, and I am here to help my friends not get into that trap. Americans especially have no clue what socialism actually is, they have not lived it (yet). Fact: Trevor LaBonte, is pushing the International Jewry’s national socialism. 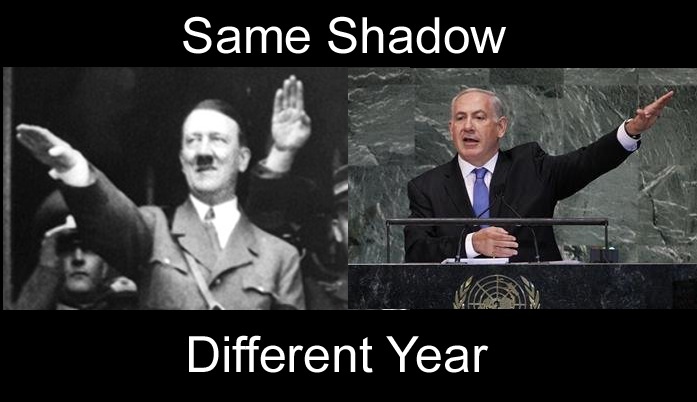 Many people think actually that since Hitler was ‘against’ ‘the Jews’, he is their friend. Was Hitler against the Jews that financed him? Or just some other low level class ‘useless eaters’ (ref. Heinz Kissinger) of the socalled ‘Jews’ (Khazars, Edomites), so the higher class ‘Jews’ can keep on ruling and made their usury by their banking business, always profiting on both side of the wars they expedite? To get this wars, you MUST setup two opposing sides, the one against another. Both sides political leaders is controlled, to assure you get the correct outcome. ― Vladimir Ilich Lenin aka Jewish name Blank, aka Ulyanov. Opposing forces in World politics is all an illusion. They are not idiots. They will not start any wars unless they can control the outcome, with leaders who can betray the interests of the people on behalf of themselves. The clue to be sure of victory is to control both the opposing parties and systems. Always been that way, always will be that way. I have noticed that many have found a new adoration for Hitler and national socialism today, because he and the Nazis was allegedly fighting the Synagogue of Satan during WWII. Did he? “They implement the Laws they need, to protect themselves”. The film “Enemy of The State” (1998). Brinn (Gene Hackman), ex. NSA. There is a lot of Jewish shills promoting National Socialism and nazism, because if the ‘Jews’ is to set up their New World Order, they need resistance (as per Kaballah, nothing can be born without resistance), as Teodor Herzl said; «Anti-Semites is to be our best friends». That means as REACTIONs to the anti-semites they will setup Enabling Acts, Patriot Acts, and Homeland Security Acts, all for their own protection, not for the peoples protection. Like Lenin (Blank) and Trotsky (Bronstein) wasdoing in the Jewish Bolshevic revolusion, the law against anti-semittism was the first law they made, so killing 66 million anti-semites, russians, in the GULAGs was actually legal, from their point of view. That is how it become when ANY socialist get in control of the States legaslative powers. The real opposing forces in the World is Satan and Christ.. ALL world leaders are involved in the plot, on Satans side in my opinion.. they do as Hitler serve and support some good causes initially to come to power, but after that they are the same old satanic anti-Christian agendas, developing in an tyranical direction. This kind of retorics is playning right into the hands of the people you are seemingly against. 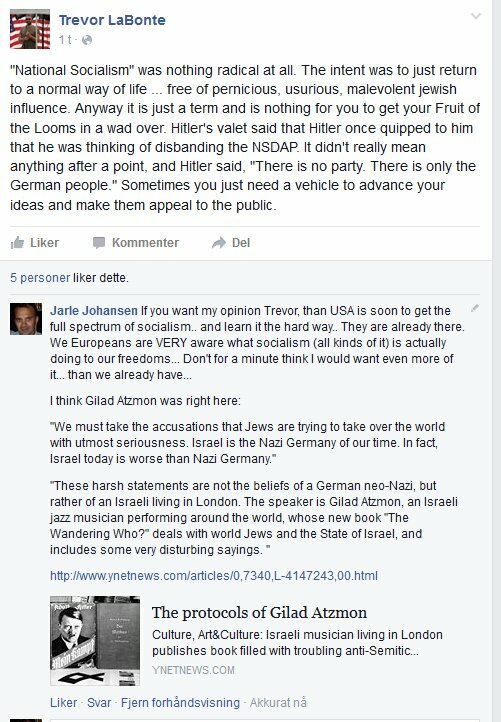 I was deleted from Trevor’s friends list by highlighting that Gilad have a different opinion on Nazism. LOL. Maybe beginning with yourself dear Trevor. In my opinion Gilad Atzmon is ‘real deal’. I as Gilad is sceptic of pushing Jewish socialism aka Hitlerism. I was simply stating I supported Gilad’s stand of nazism, and that the comparition of Israel and the Nazi State is accurate (Note, I am in favour of a national homeland for ALL people, as this is what the Bible says is the natural order of things (Gods people is to live separate, Numbers 23:9, Ezra 9:12, Deuteronomy 7:3), so I am thereby against internationalisation and multiculturalism). This is the command to Israel, to the Lost 10 Tribes of Israel in Europe (Caucasians). Synagoge of Satan wants it otherwise and is pushing multiculturalism, and sending hordes of red barbarians our way, an invation, to Holocausting the REAL ‘Israel’. So deep is Esau’s hatred against his brother Jacob (Israel). That was not popular. No other opinions allowed, smack, closed for commenting. 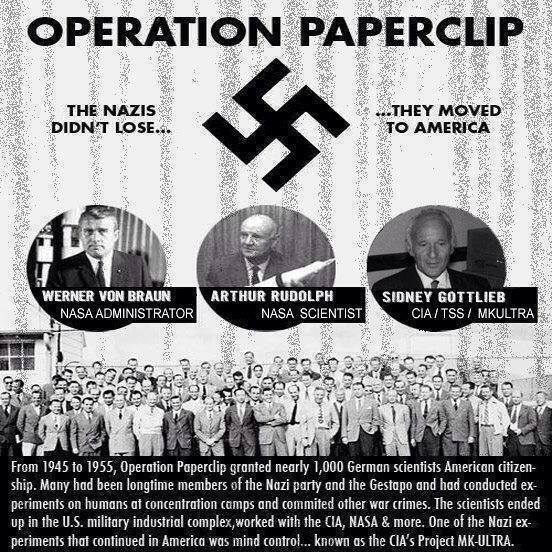 Reference is made to ‘Operation paperclip’, the importing of nazists to USA after WW2, some of them forming CIA (Gehlen). Bush, the head of CIA still today, real name is Scherff. And Kissinger is Heinz… George H.W. Bush: “If the American people knew what we have done, they would string us up from the lamp posts”. They are the todays national socialists, in services of The Crown, the fake ‘Israelites’, Khazars and Edomites hijacked and taken control of the monarchies of the Lost Ten Tribes of Israel. National socialist (nazis) and international socialist (communist) in co-operation have finally gotten hold of America, the long awated aspirations for dominion over the last free country in the world. That’s the synthesis coming out of WW2. Modus operandi is the sublimal control of the national socialists (nazis) working in the background, as the communists (Obamas camp) take the blame in the foreground. Obama is nothing else than Bush lapdog. In reality they are working together against the same goal for their international Moneymakers belonging to Synagogue of Satan. People see one in the open, but get the other in reality (the synthesis). Hitler did many good things to get into power position, as all politicians must offer pink promises for the same, but I do NOT think it should be the same as welcome socialism/collectivism ..
Look to Norway? 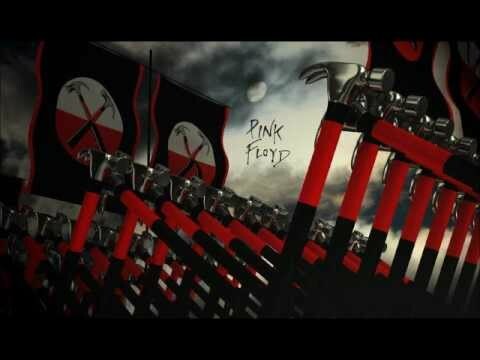 We are OK here, but remember that under all kind of socialsm you must accept that the State is overhelming in charge of everything you do, licenses, what to eat, what to say, what to think, it is an overwhelming governmental control over your life, in the smallest details of everyday life. This system that was started by Bush with 9/11 and Patriot Act (aka Hitlers ‘Enabling Act’), will be VERY difficult for freedom lovers in America to live under, because they are not used to it. It is the reason many Norwegians went to America several hundred years ago. The rest had to get used to it, and live the nightmare… Do not try to teach us this, we live in it. Give me one good reason I should support the national socialists Enabling Acts and other tyranical legal measures to keep them in power? In this my article about the European Song Contest 2010 in Oslo from 2010 you will see Norways Prime Minister Jens Stoltenberg, and the full Telenor Spectrum arena doing the National Socialism salute… everybody as by magic or mindcontrol from an artist did it. It is amazing what good retoric and the massminded can do when they are inspired and led to the slaughter. 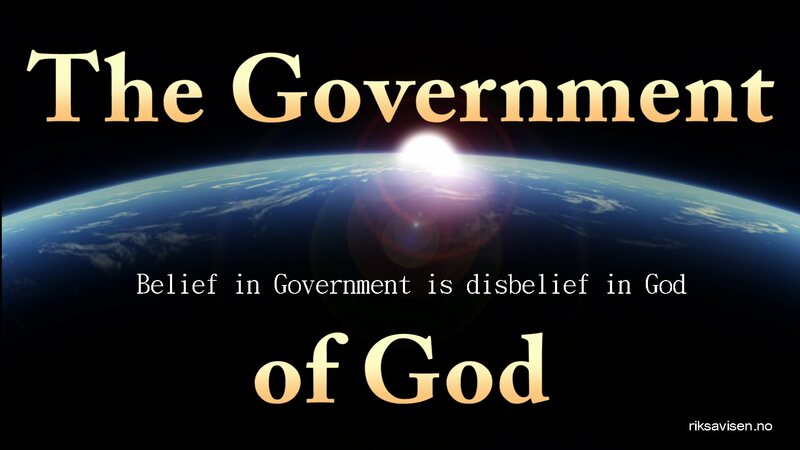 The worshipping of the State powers are todays the Worlds biggest religion. Who controls the States/nations if not ‘The Wandering Jew’, the askeNazis? 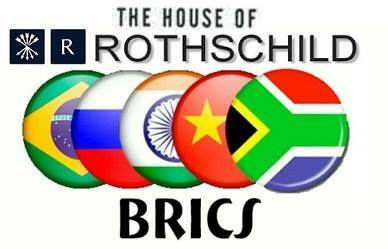 Who is protecting the debt and usury system of the King of Israel, Baron Rothschild? Evidence; ALL Nations protect them with legal instruments.. criminal code. Where the State serves the People, protecting the freedoms of their people, leadership are not their rulers but servants, we have a Christian state. This change in policy of the States, is why most people are so confused by their political leaderships priorities. They fail to understand that their leaders are not serving them at all, but they serve the ‘Master Race’, and get their orders from there, not from the public opinion. In the opposite, we have an Jewish state, an authoritative tyranny. As the normal ‘Jews’ (actually there is ONE tribe of Judah, and 11 other tribes of Israel, and than there is the ‘red’ Edomites, the Kenites, etc, all today goes under the slogan ‘Jews’ what is incorrect), lived under the opression of their leadership on the times of Jesus, and what Jesus was killed to free them from. Jesus said he came to the Tribes of Israel ONLY to free them from the mental slavery, not to the Jews (Judah), not to the Edomites, not to the Kenites. The State will give you privileges, not rights. You remain servant of the State under all collectivist regimes. The States original purpose was to protect the interests of the people. Not in old Israel, The Northern Kingdom (tribes of Israel) split with the Southern Kingdom (Judah/Edom) in old Israel because of this tyranny they implemented, Israel wanted another King. I support Germans and want them to get out of the guilt complex they are put into by the victorious ‘Jews’, but no socialism – I know too well national socialism from my homecountry Norway – it is really not much different than international socialism (communism)…. A sobering lecture explaining how the right and the left are just the two sides of the same monster. «It is thus necessary that the individual should come to realize that his own ego is of no importance in comparison with the existence of his nation; that the position of the individual ego is conditioned solely by the interests of the nation as a whole … that above all the unity of a nation’s spirit and will are worth far more than the freedom of the spirit and will of an individual. …. This state of mind, which subordinates the interests of the ego to the conservation of the community, is really the first premise for every truly human culture …. we understand only the individual’s capacity to make sacrifices for the community, for his fellow man.» – Adolph Hitler, 1933. I know too well national socialism from my homecountry Norway – it is really not much different than international socialism (communism)…. ZOG: The ‘Choses-ones’ will have their marxist socialism anyhow what ‘side’ is chosen off the different socialisms, and as long as they are rulers of the state apparatus, we’re in a nation completely indifferent from the vision of Christs ideal community. Christs community arrangements is behind us now, was developed upwards through 2000 years, we had some good times in Norway and USA, now it is going downwards, because now it is the endtime for the ‘Jewish’ Anti-Christ, the Jewish form of Government that will have it’s time to rule the West, as in Soviet/USSR 70 years ago. Beware. I have warned you. This is going to be bloody. They will protect their State and their powers will all means, just like Trotsky (Bronstein) and Lenin (Blank), and Stalin (the Allied). It is time to get into the Kingdom of God through the one-way solution; Jesus Christ. The train is leaving the station soon. 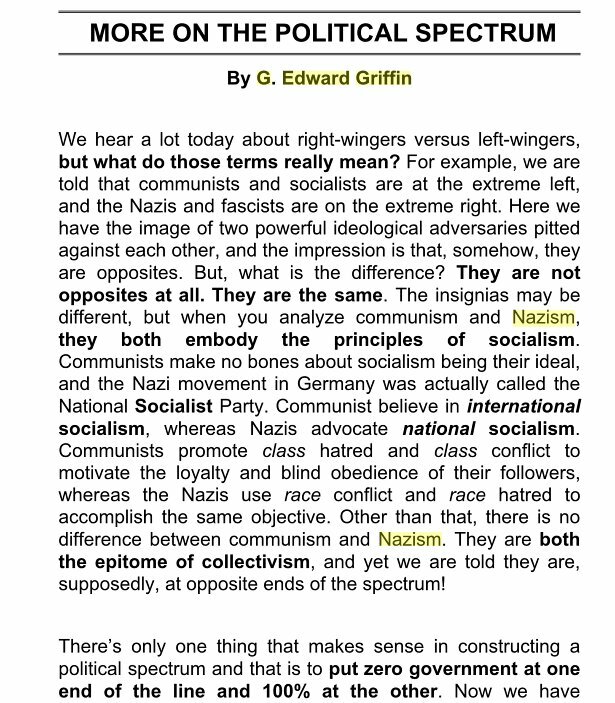 How Are Socialism, Communism and Fascism All the Same? 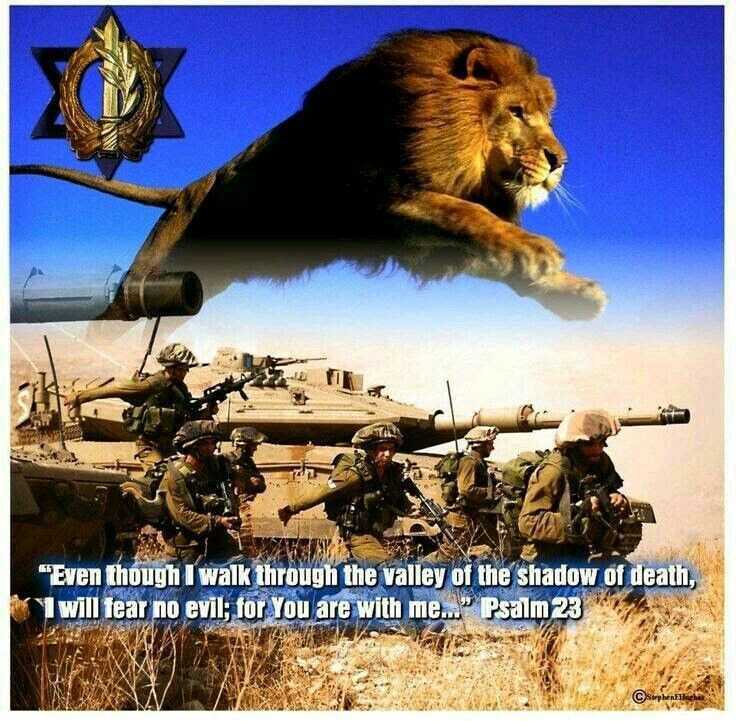 “There is a man alone, without family, without children, without God….He builds legions but he doesn’t build a nation. A nation is created by families, a religion, tradition: it is made up out of the hearts of mothers, the wisdom of fathers, the joy and the exuberance of children. [Of Germany under Hitler he says]….an all-swallowing State, disdainful of human dignities and the ancient structure of our race, sets itself up in place of everything else. And the man who, alone, incorporates in himself this whole State, has neither a God to honour nor a dynasty to conserve, nor a past to consult…. For a few months I was inclined to believe in National Socialism. I thought of it as a necessary fever. And I was gratified to see that there were, associated with it for a time, some of the wisest and most outstanding Germans. But these, one by one, he has got rid of or even killed…. He has left nothing but a bunch of shirted gangsters…. 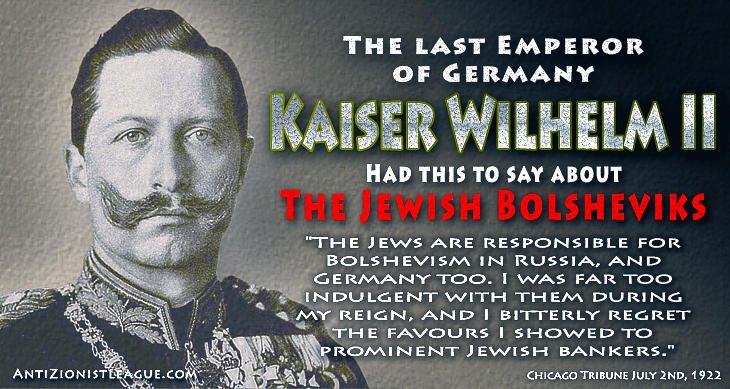 Thanks to Kaiser Wilhelm for the contributions to build up my hometown after the whole city burned down in 1904. This is the Spirit of the German people. NOT Hitler. Aren’t we just awful happy here on Animal Farm with the herd mentality of the Socialists? Plenty people is preparing the bed. They will have to lay in it at some point in the future.